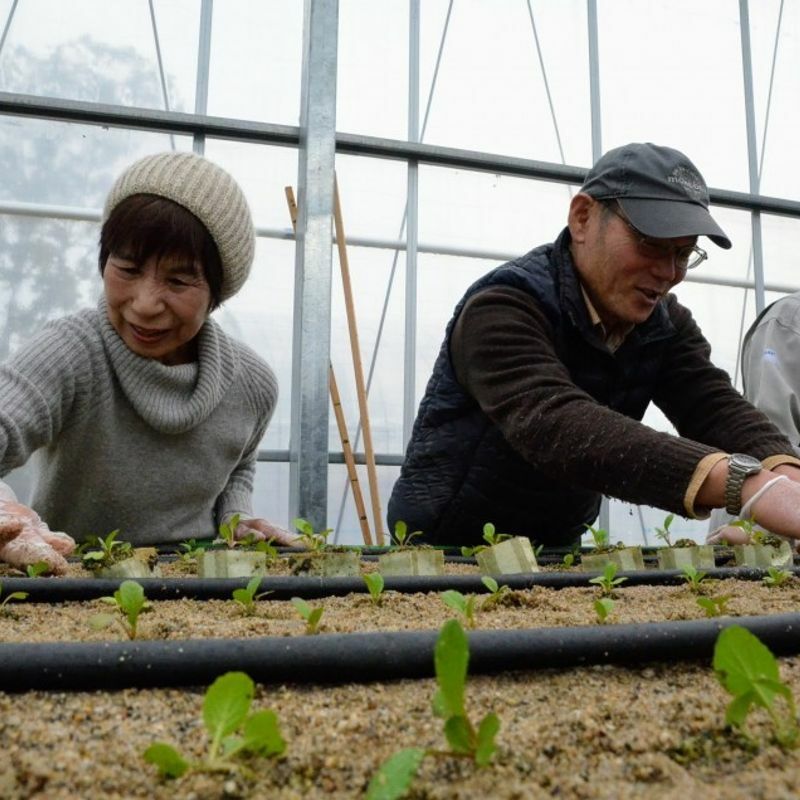 KYOTO - A Japanese company has developed an easy way for people in the community to take part in farming through the Internet, with its demonstration farm gaining momentum and becoming a gathering place for local residents in Kyoto. 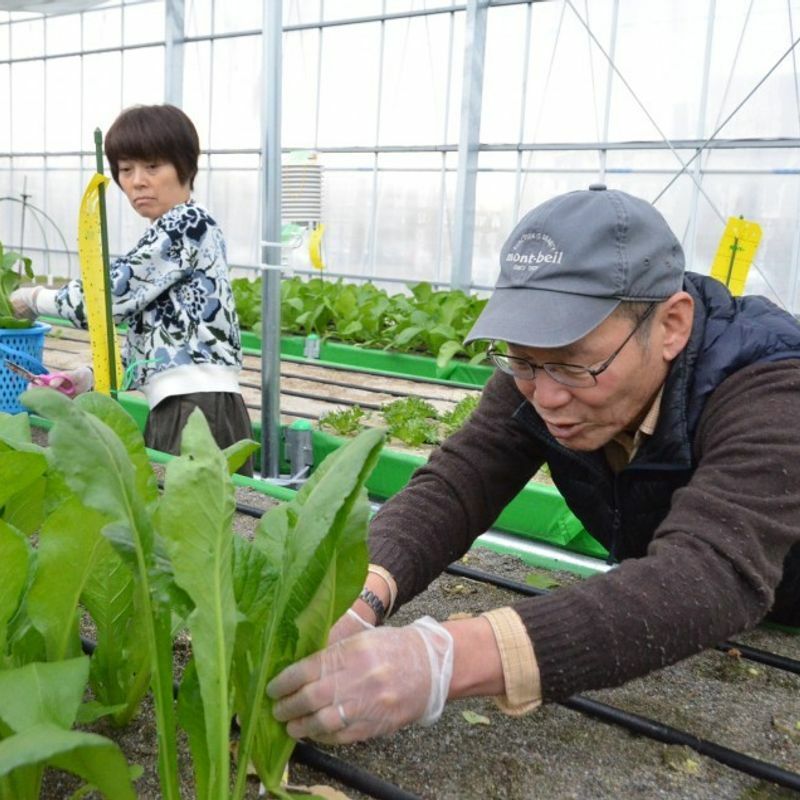 Toray Construction Co., a real estate and construction company, came up with a model called "sharing" agriculture, which allows participants to sign up online to do simple tasks in the greenhouse. The Osaka-based company joined hands with several institutions, and together they started a six-month demonstration experiment in September after receiving funding from the government. "Agriculture is difficult. It's hard to start farming just because you want to do it," said Yasutaka Kitagawa, who is in charge of the project at Toray Construction, in a recent interview with Kyodo News. "So we thought, what if we come up with a system where people can share the workload and be able to decide when to come to the farm." "If there is a system like that, more people who are interested in agriculture can get a chance to do what they want to do," Kitagawa said. The system is easy. 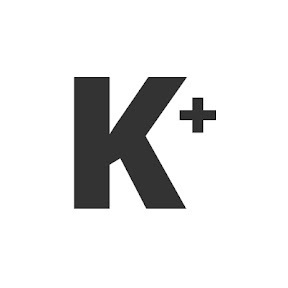 Interested people sign up online by entering their basic information, such as their age and gender, and select a date and a two-hour task that they are willing to do. There are nearly 100 "supporters" registered online, and around four participants gather everyday to do simple jobs such as planting seeds and harvesting. They are not paid to work, but they can bring home the crops harvested at the farm. 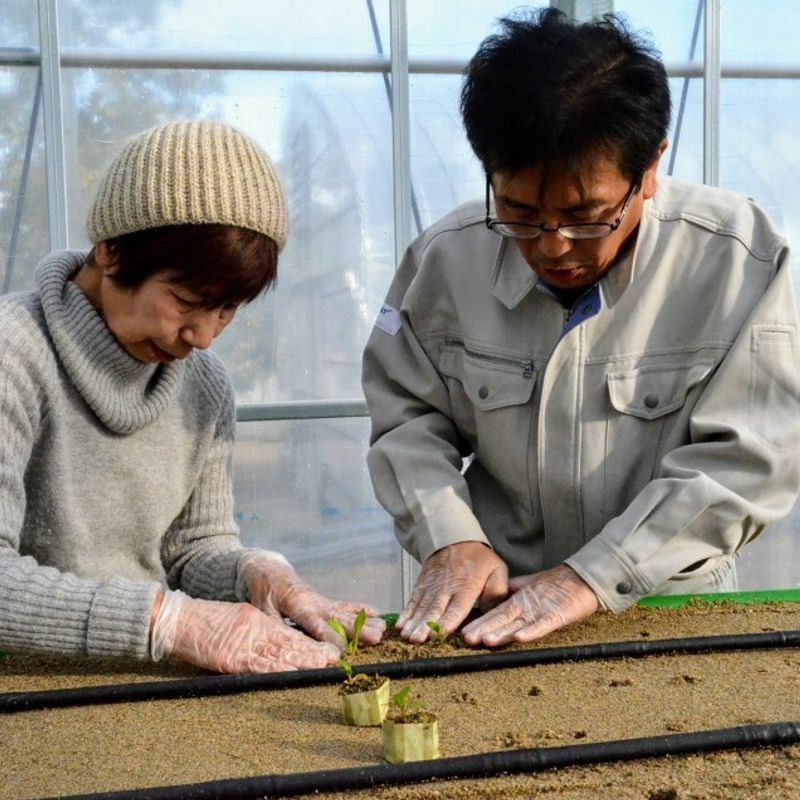 The greenhouse called "Torefarm" located on the property of the Advanced Telecommunications Research Institute International in Seika, Kyoto Prefecture, western Japan, is full of innovative twists. It makes farming easier for women and the elderly by minimizing the physical workload in the field. Vegetables such as Japanese mustard spinach and cilantro leaves grow on sand spread on table-like platforms lined up in the greenhouse. Participants can work in a standing position, and do not have to bend down at all. Sensors and tubes in the sand allow operators to gather information about conditions at the farm through an Internet cloud service. Toray Construction officials can provide water and liquid fertilizers from their smartphones and computers anytime, anywhere. "There's a Japanese teaching that says 'eat until you're 80 percent full'," Kitagawa said. "I think it applies to working too, especially for the elders. It will become a burden if you work too hard so this system allows people to enjoy farming without the need to push themselves too hard." The demonstration is gaining steam and about 30 percent of the participants are 60 or over. Spreading by word of mouth, it has also become a place for local residents to meet new people. Mai Otani, 43, a local housewife, said her involvement has given her something to look forward to during her free time. "It's held every day so I'm really thankful that I can just stop by and work for two hours during my spare time," said Otani, who took part in the experiment in December for the third time. "And we can come whenever we want to and are allowed to make last-minute cancellations too, so I always feel welcomed and it's easy to come." Otani sees the benefits in her meals at home as well. "Sometimes I get to take home vegetables that I usually don't eat at home like Chinese water spinach. So we have more dishes on the table, and it's exciting to come up with a recipe too, even though it is fresh and tastes good by itself." Tsutomu Okuno, 64, said the best part of his experience is that he gets to interact with people. "Working here is obviously really easy and not physically demanding," said Okuno. "But it's more than that -- it's really fun because we get to talk all the time." Earlier this year, a consortium led by Toray Construction received about 38 million yen ($335,000) from the Ministry of Internal Affairs and Communications as part of the "project for IoT services creation." The government project requires participants to come up with issues to be solved in order to spread the use of the "Internet of Things" (IoT) and create an advanced reference model, according to the ministry's website. With the funding, Toray Construction is staging another demonstration experiment in Chiba Prefecture, near Tokyo. However, Kitagawa says there is still room for improvement if the "sharing" system is to take root. Kitagawa wants to create a revenue-generating model and make the farms an employment opportunity for elders as Japan looks to deal with an aging population. "As we experience progress in the aging of our society, I think it's necessary for senior citizens to work too," said Kitagawa. "But it's difficult for them to work like they used to, so they need to start working differently -- with less physical requirements. And I want agriculture to play a part in that." For that, Kitagawa emphasizes the importance of producing vegetables with higher market value compared with the Japanese mustard spinach and Chinese cabbage that are currently made. "If we produce something with a higher value, we can earn money even if the supporters work slowly," Kitagawa said. "At the same time, we want to lower the cost of the Torefarm so many people can start operating it." Kitagawa hopes the "sharing" model breaks new ground in agriculture through community cooperation. "I think the 'sharing' model doesn't work for people who want to make money through agriculture," said Kitagawa. "It's for those who want to cooperate and borrow the hands of the residents of the community."